The successful keeping of fish depends on their good health. Good fish health comes from having acceptable water quality and from feeding a good quality fish food. 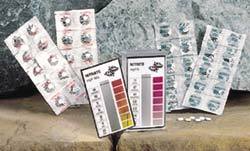 In order to ensure that the water is of an acceptable quality we always recommend the use of test kits. Hozelock Cyprio test kits have been developed to keep a check on the quality of the water in a garden pond. They cover the four main chemicals that are related to poor fish health and ineffective filtration. 1. Ammonia - The major waste product from fish and rotting material in a pond. It is toxic to fish, but its toxicity is very dependent on the temperature and the pH (acidity/ alkilinity) of the water. 2. Nitrite - The secondary waste product found in the pond. This is produced not by the fish, but by bacteria that feed on the ammonia and convert it into Nitrite. Nitrite is not as toxic as ammonia, but it can be just as deadly. 3.Nitrate - The tertiary waste product found in the pond. This again not produced by the fish but by another set of bacteria that live in the pond and filter system. These bacteria convert nitrite into nitrate. Nitrate is relatively harmless, but contributes to algae growth in a pond, and in high concentrations can lead to fish becoming stressed and subsequently unhealthy. 4. pH - This is a measure of how acid or alkaline a pond is. Most pond tend to have pH higher than 7. This means that they are alkaline. 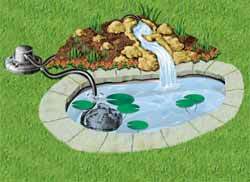 As a pond becomes more alkaline, the effects of Ammonia are worsened. The job of a biological filter is to convert ammonia to nitrate. The nitrate encourages floating algae to grow. We then remove the algae using a combination of the biological filter and an Ultra Violet Clarifier (or UVC). Then when the filter is cleaned we are able to remove the algae (and the Nitrate they contain). Also regular water changes help to dilute and remove the Nitrate. 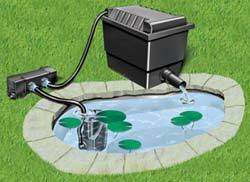 When a filter system is new or not working properly this doesn't happen, the effects of this can be sick or dying fish and a pond in poor overall condition. The Hozelock Cyprio testkits are supplied in pairs, each set of test kits contains a small yet invaluable booklet on water quality management. Test Kit 2: Nitrite and Nitrate.